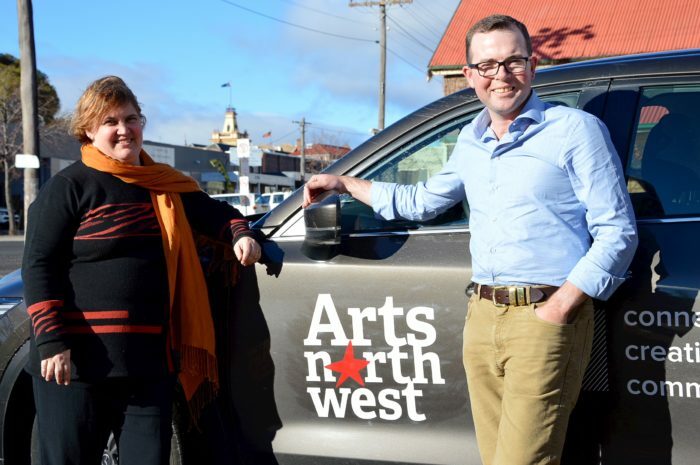 Arts North West executive director Caroline Downer and Northern Tablelands MP Adam Marshall in Glen Innes this week. ADDITIONAL State Government funding to the tune of $95,000 will help Arts North West create a cultural and business splash for aboriginal art across the region, according to Northern Tablelands MP Adam Marshall. Mr Marshall said the funding would boost both indigenous art and professional development in the arts sector and inject new found business building skills into the Aboriginal artistic community. Mr Marshall said he was delighted to deliver news this week of the funding to the Arts North West organisation to boost their work in cultural arts circles. “Arts North West is a great driver of development in the arts across the region, helping to build a richer cultural landscape and increasing the numbers of people and professionals involved in art and cultural activities,” Mr Marshall said. Arts North West executive director Caroline Downer described the $75,000 grant for the Creative Koori project the organisation has won as “fantastic news” for regional arts and cultural support. Ms Downer said the grant would allow them to extend the employment of Aboriginal Arts Officer Lorrayne Riggs to develop a regional strategy designed to not only increase the professional development of artists but also build their business skills. “We’re very excited about this; it’s the first employment grant funding under a state program for us,” Ms Downer said. Creative Koori will work with Aboriginal artists to provide workshops, mentoring, networking and community consultation. Mr Marshall said the project would work across five of the 12 local government areas that Arts North West covered, with Moree, Inverell, Narrabri, Gunnedah and Tenterfield the target markets for Creative Koori. The second successful grant was for $20,000 for the Create the Curator project Arts North West will manage. Ms Downer said four curator candidates would be selected to undergo an intensive professional development program designed to teach them everything they needed to know about putting together an art exhibition from beginning to opening. “They might not necessarily be an Aboriginal artist but they will be regional people involved someway in the arts,” she said.